"Flamenco is not about the steps. Flamenco is about the compás"
Linda Machado is a full-time working professional Flamenco & Spanish dancer with 20 years’ experience who performs in concert halls, theaters, museums, restaurants, night clubs, schools, libraries and cultural venues throughout the Southwest and Mexico. 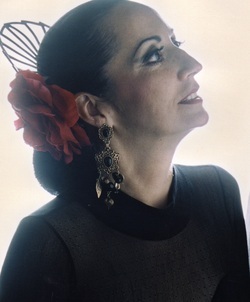 A former member of Daniel de Córdoba Bailes Españoles dance company, Ms. Machado is the Artistic Director of Un Corazón Flamenco, a professional Flamenco performance company. Ms. Machado was introduced to Flamenco and Spanish Dance by Daniel de Córdoba who was a member of the legendary José Greco Dance Company. She went on to study with many renowned national and international Flamenco artists including Javier de la Torre, Omayra Amaya, Antonio Hidalgo, Yaelisa, Monica Bermudez, Lydia Torea and Joaquin Enciñas. Ms. Machado spent several years as an artist with Young Audiences of Greater Dallas, conducting numerous school programs and residencies throughout Texas, and was associated with the Northeast Tarrant County Arts Council as a Flamenco dance instructor. She teaches Flamenco dance and culture at Flamenco!…the Studio™ in Tempe which she co-owns with her husband, Master Flamenco guitarist Ricardo de Cristóbal. Ms. Machado’s Flamenco dance style is infused with the passion and power of Flamenco, the grace and elegance of classical Spanish dance, and the exhilaration of improvisation – the most basic fundamental of authentic Flamenco dancing. She has the ability to communicate expertly with accompanying guitarists and execute clear, strong and rapid Flamenco zapateado while maintaining the posture and graceful arm work of a Spanish dancer. Linda is Ms. Sr. Arizona 2012 Talent Competition Winner (for Flamenco dance) and holds 2nd place for the title of Ms. Sr. Arizona 2012.